I found the house out in Athens, GA while out in Chicago. It was through a Facebook page my sister was on, in where the girl was leaving for Summer break and needed someone to rent it out. I was quite nervous, because in my head I had created Athens as nothing more than a small southern town with small southern minds.. which is just not the case (but my fear and the past had manifested itself in such strange and imaginary ways that I could not even begin to process it). When Dani Ela and I had first talked on the phone I was incredibly wary until she told me she was from Vancouver. “Oh Jesus you are from Canada. Thank god”, I said. The house was off of Easy Street in an area called Normaltown. Dani and her husband Thor were so incredibly cool. While they were only here for a few weeks (before they left the entire house to myself) my time with them was incredible. There are memories of us late at night underneath the candlelight of their screened-in porch laughing and playing music with their friends…. and one memory in particular was the massive showering rainstorm that shot down through the southern sky into our town. Dani and I ran out in the rain screaming and laughing while the sorority beginner house across the street looked at us like we were insane. I was fascinated with them, so much that my already budding curiosity of Canada, spread like wild kudzu across my brain. Dani and Thor talked about Vancouver with me as much as they could.. and when they left I began to study Canada for weeks. In that old white house, on the screened-in porch, I painted alone for weeks. What once held the laughter and music from my housemates was now replaced with the soft night wind intermixed with the distilled humming of a discordant orchestra of crickets and cicadas. I silently navigated myself socially through Athens in the daytime that summer, often through working the AM shifts at The Last Resort Grill. In the evenings I would spend time with my sister and her husband in their cool modern style home that resembled a romance between Franklin Lloyd Wright and Tennessee Williams. In the evenings however, when I’d take off my backpack and change out of my soiled waiter clothes… I’d sit there on the porch alone and paint my dreams of Canada. This piece is called “Canadian Circuitry”, and without the help of Dani and Thor, this conception would never exist. In this painting, I have created a home for each city in each province. Each city describes a certain portion of the area and its surroundings. There are green avenues which relate to the parks and forests that are near each area. In Mickey’s face are the other cities that held a high population, as well as the territories of Canada. This is the last of the “Around the World” Collection and resides as No. 95 in the series of 100 for TENxTENxTEN. Japan has always been such an intriguing country to me in so many ways. From their cultural practices, art aesthetic, entertainment, language, and history, Japan wrapped up into one painting became incredibly difficult for me to paint. I would say it was difficult not only for the complexity of it’s vast cultural circuitry, but also I had not seen it with my own eyes. 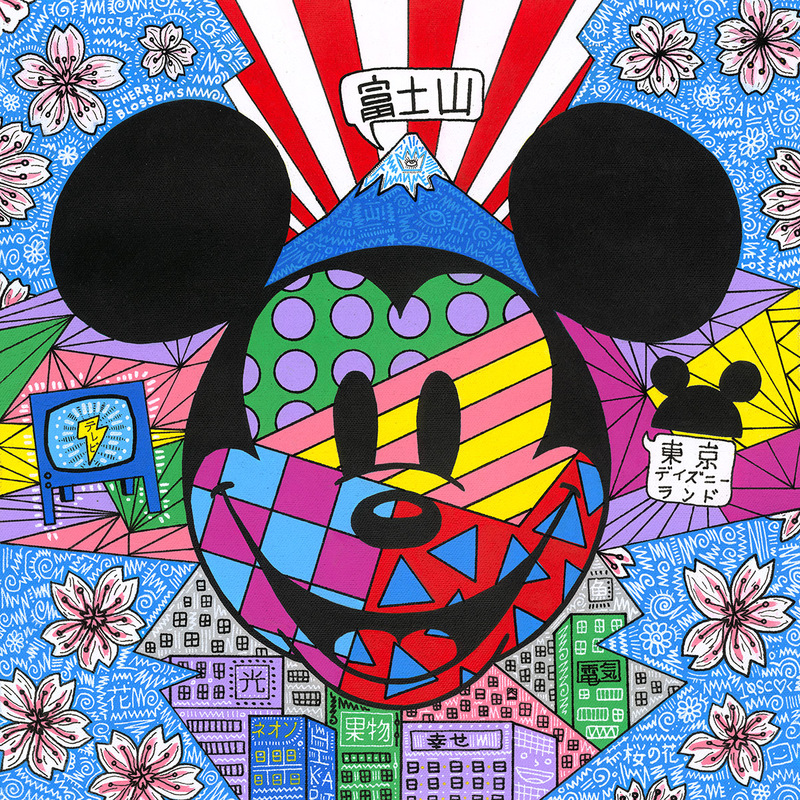 Regardless, this piece is called “Mikki No Sekai” which stands for “World of Mickey”, and I’ve focused a high saturation geometric pattern concept inside his face, that bursts out from either end in a display of colorful linear webs. On either side of his face is both a television that references a portion of their entertainment culture, and a Mickey Mouse hat that represents the park in Tokyo. On every corner lies a sea of cherry blossoms (Sakura), which contain the city of Tokyo underneath, and Mt. Fuji above his face. This was one of the only pieces of the TENxTENxTEN collection that was painted in my artist residency which was in a shipping container out in Las Vegas, NV. “Mikki No Sekai” is a part of the “Around the World” chapter, and resides as number 88 in the collection. Checkerboard: Moments and memories of joy. Also, there is two Mickey Mouse hats speaking in speech bubbles the symbols of flowers translating the ‘joy and happiness’ that Mickey Mouse creates. Each sector of this piece has colors that connect with each other. The background is red with black drawings with white accents. 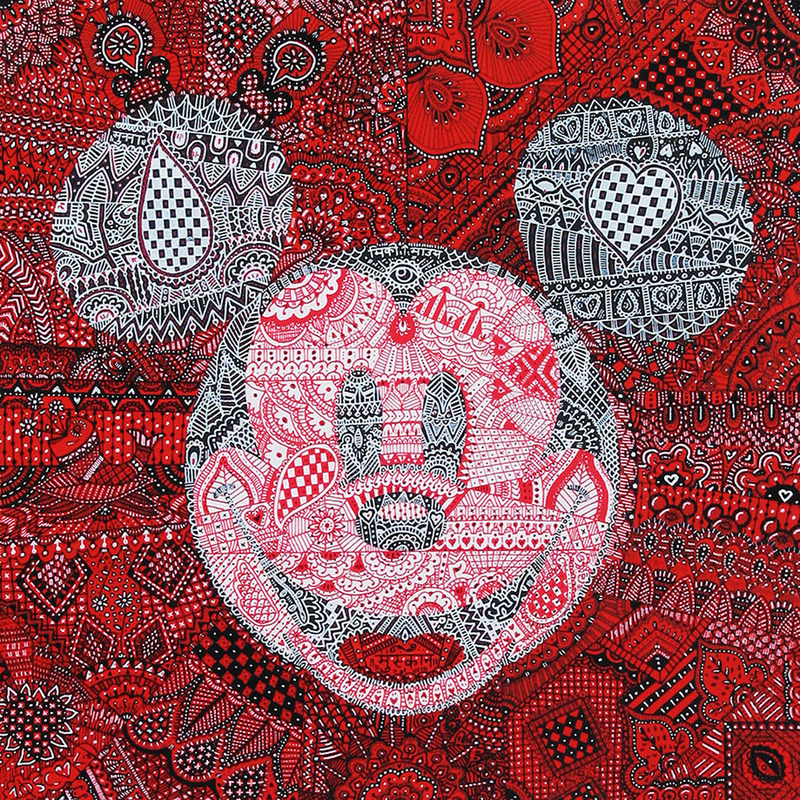 The border of Mickey has a black background with white drawings with red accents. The face contains a white background with red drawings with black accents. This represents the common thread of intertwined continuity, representing that our character is not alone, but connected to every person, place, and thing in this world. 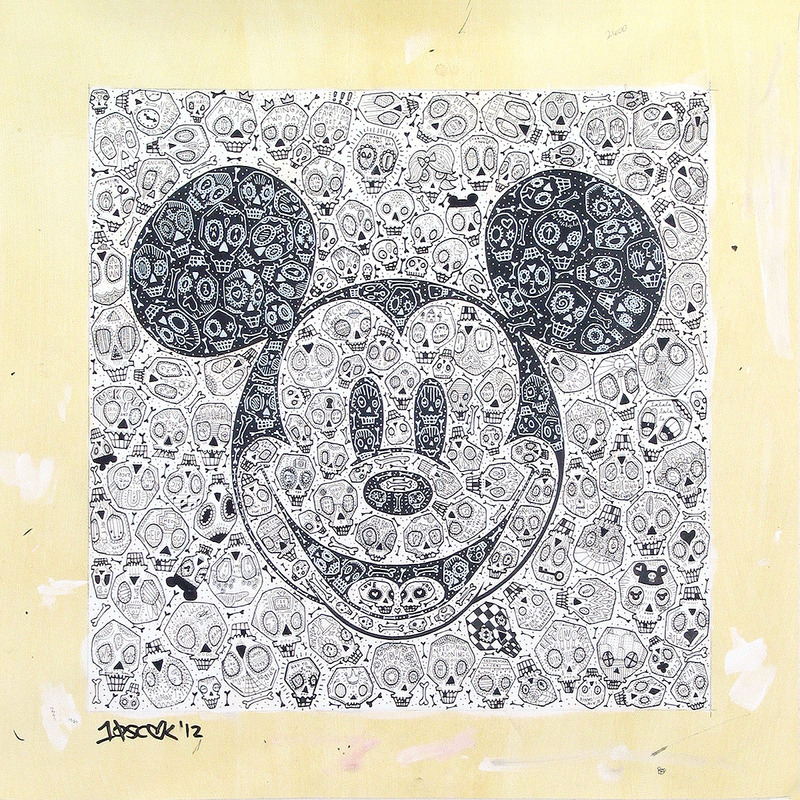 Hidden in this piece are also words in Sanskrit for love, happiness, and Mickey Mouse. Last month I went to New York City to get some inspiration for the “Metropolitan Series” for the TENxTENxTEN project. It had been almost 10 years since I had been back, so my mind was virtually blank when it came any kind of inspiration or possible idea for the piece. I think the last time I was in NYC I had just re-emerged my desires to be a painter, so my thought processes and understanding to convert my visual landscape into a project were at best minimal, if at all, existing in the first place. What we were actually attending was LOGO Channel’s “New, Now, Next Vote”, a political program “aimed to educate, activate and entertain viewers, while shining a spotlight on the state of national politics through an LGBT lens.” We were part of the guest audience of the live taping. It was a great show, filled with some incredible people (including Rep Barney Frank). The debates were very entertaining and informing, and I was … for the most part trying to be an active participant, but… was having somewhat of a difficult time paying attention because of one detail of the entire show. Being that we were in the audience, we were faced towards not only Wanda Sykes and the political speakers in the show, but also the massive window behind them that looked over Times Square. Behind the window was this massive video billboard that aired a 3 second clip that kept on repeating. It showed Obama, then Romney followed by stripes and stars from the American flag flying across their faces. While the whole show was happening, I was mostly engaged, but at the same time I was transfixed by calculating the amount of times the clip repeated over and over again. For instance, since the clip was 3 seconds, I couldn’t help but think that the clip played 20 times in a minute, or 200 times in ten minutes. And since we were there for 2 hours and 14 minutes, that… the clip played 2,680 times. Not did I end up doing that, but then I started calculating the times that Obama and Romney appeared .vs. the stars and stripes. Obama and Romney had 2 seconds of time, stripes and stars had 1/2 a second each, meaning that in 2 hours and 14 minutes, the candidates appeared on the screen 4,020 times, and the stars and stripes shown against our faces 16,080 times. And this my friends, was why I was in special ed classes for most of my life. Because this screen was going on and on, my head transported into ideas of doing a Mickey head. I had already done a Mickey previously for Disney Fine Art in the realm of Americana, which was called “Mickeymerica” (Limited Editions available on DisneyFineArt.com/TennesseeLoveless) back in 2011, which was selected as the official July 4th print for that year. I wanted to do the same format, but in the realm that was similar to the repetitive screen happening. In the screen the stripes were cold and the stars were warm, which clearly were the reversal of the traditional color format of the American flag. This suddenly became the direction for the new work. This piece is number 38 in the collection, and the 5th in the series, marking the halfway mark for this sector of the project. 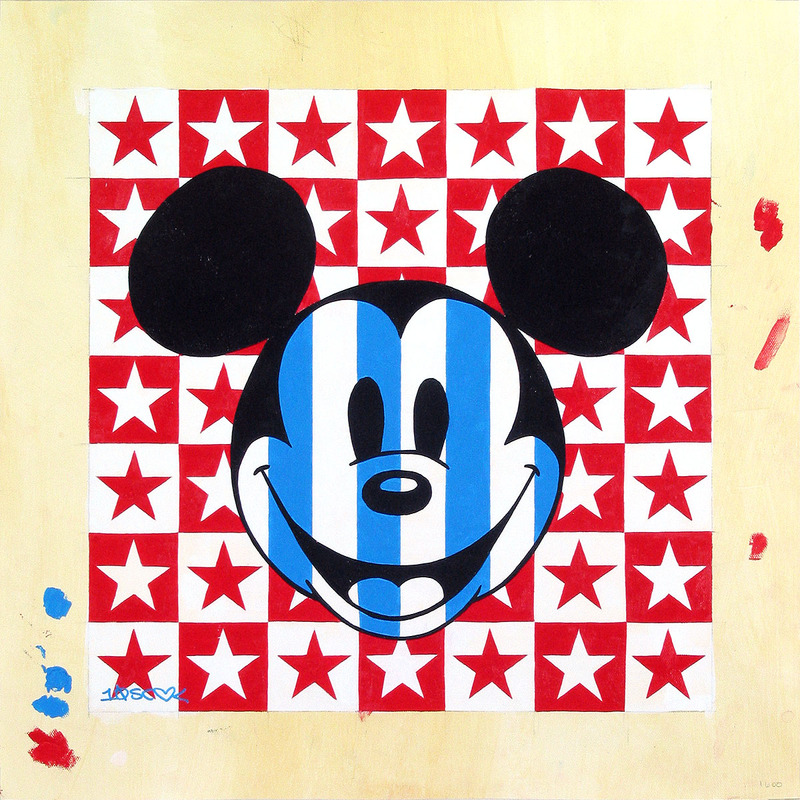 It is called “United States of Mickey”, and represents America for the project. The first piece, “Dia De Los Mouseos, Execution Uno”, was more on the approach as ‘a study on skulls’. This piece, entitled “Dia De Los Mouseos, Execution Dos”, was far more intricate in detail, and as my hand got used to the drawing and redrawing of the skulls, the individual pieces became more complex along the way. I decided to get some inspiration on where I first learned of “Dia De Los Muertos” (Day of The Dead), and traveled 381 miles North to San Francisco to focus heavily on this painting, and how I could make it more balanced. You would think that I would be traveling to the border instead, but I’ve found that most Day of the Dead art was more heavily saturated in San Francisco. I may say this because SF is far more compact and therefore visually saturated than any Californian city, but I digress… I just traveled to where this holiday and cultural tradition would make sense from a nostalgic standpoint, as well a well connected cultural reference point for the piece. When I had first moved from San Francisco from Georgia (and my eleven month stay in Philadelphia), I had little to no education on Mexican culture. In fact, being raised in Georgia, which was predominantly African-American and Caucasian, I had very little contact and information of Mexican or any other race out there. When I had moved to SF, I was heavily saturated in Mexican , Chinese, Russian, and Japanese culture upon impact. My lack of knowledge left me feeling quite uneducated and insecure, so I sought to educate myself on other races and their traditions. In the first week of November, the Dia De Los Muertos festival began in the Mission district of San Francisco. The streets glittered with decorated skulls, stilt walkers, coffins, and people dressed with sugar skull make up on their faces. November 1st was the first day, which is entitled as “Dia De Los Angelitos” (Day of the Little Angels) or more commonly “Dia De Los Inocentes” (Day of the Innocents) which honors the children and infants who have deceased. November 2nd is Dia De Los Muertos, which celebrates and honors the adults who have passed away. Music blared all through the night while parades of costumes flamboyantly danced around the main drag of the district. I was transfixed and overwhelmed with the beautiful process. I had never seen something so elaborately done for most of my life and my normal tepid southern white upbringing. Comparatively my mediocre caucasian traditions paled to anything as eccentric and homage filled as I was seeing. And from that year on, I made a concerted effort to continue to watch from the side lines this incredible parade pass by. So four years later since living in Los Angeles, I sought to return to my Californian stomping grounds and remember first hand about that time and the art that surrounds the city over this incredible holiday. This painting belongs to the “Around The World” sector, and focuses itself as an homage to Mexico and its culture/traditions. Each skull is decorated like a traditional Day Of the Dead Calavera (Sugar Skull), and EACH one has a tiny story and personality attached to it. Put together, all of these tiny pieces come together in one massive story and collection to form Mickey Mouse’s face. Originally this idea came from a popular picture that was circulating the internet (ie: meme) that began to interest the public in both domains of the web and consumer goods. 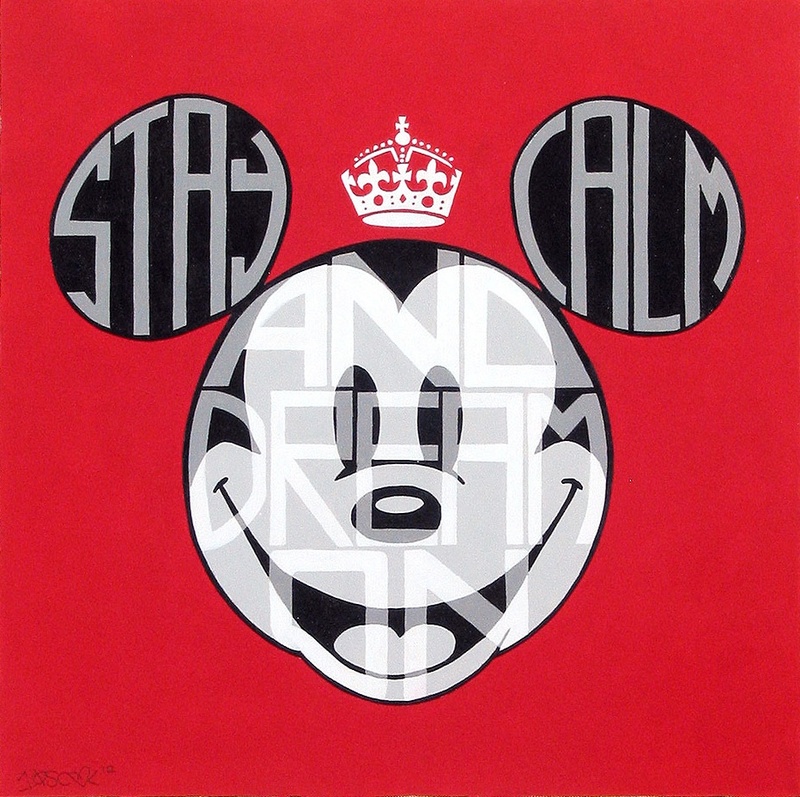 “Keep Calm and Carry On”, which is the original phrase was issued as a poster in August of 1939 during World War II by the “Ministry of Information” in The United Kingdom. There were two others which were ” Freedom Is In Peril, Defend It WIth All Your Might” and “Your Courage, Your Cheerfulness, Your Resolution Will Bring Us Victory”. These three posters were issued to the public to inspire the British people and raise the country’s spirit during the first few weeks of war which were deemed times to demoralize the British population. Sixty one years later in 2000 the poster was reissued at a shop in Alnwick, Northumberland with medium success, however in 2009 is when the phrase and design had reached epic levels of distribution both through products and internet usage. This spread of the meme was due to the public’s panic in the UK over being in dire straits over the then (and current) global economic dilemma. …and most of all, .. when we believed we could make a difference in a scary and often troublesome world.